Shampoo compositions comprising a) a detersive surfactant, b) silicone particles, c) a protecting agent and d) an aqueous carrier provide superior conditioning. The silicone particles contain at least one amine functional silicone and optionally a non-amine functional silicone. The present invention relates to conditioning shampoo compositions containing silicone particles which provide improved hair conditioning performance. Conditioning shampoos containing various combinations of detersive surfactant and hair conditioning agents are known. These shampoos have become more popular among consumers as a means of conveniently obtaining hair conditioning and hair cleansing performance all from a single hair care product. One approach at improving the overall conditioning performance from a conditioning shampoo involves the use of silicone conditioning agents. These conditioners provide improved hair conditioning performance, and in particular improve the softness and clean feel of dry conditioned hair. These silicone conditioners, however, provide less than optimal deposition of the silicone component to the hair and/or less than optimum conditioning benefits such as dry hair smoothness, hair strand alignment (e.g., minimize frizziness), and ease of combing. Another approach used to achieve optimum conditioner benefits from a silicone has been the use of amino functional silicones. However, aminosilicone emulsions have a tendency to shear down to smaller particle sizes with very little shear force within the cleansing compositions resulting in a small particle which yields poor deposition on the hair. This leads to unsatisfactory overall conditioning. Based on the foregoing, there is a need for a conditioning shampoo composition, which provides improved deposition of the silicone component and/or improved hair conditioning benefits. wherein said at least one amine functional silicone is pre-blended with said protecting agent prior to addition to the balance of the conditioning shampoo composition. In another embodiment, the silicone particles additionally contain a non-amine functional silicone. An additional embodiment of the present invention relates to a method of making a conditioning shampoo composition comprising mixing together: a) a previously formed blend of at least one aminosilicone, optionally a non-amino-functionalized silicone, wherein said aminosilicone has less than about 0.5% nitrogen by weight of the aminosilicone and the optional non-amino-functionalized silicone has a viscosity of at least about 10,000cs and a protecting agent; b) a detersive surfactant, and; c) an aqueous carrier. In another embodiment, the conditioning shampoo composition additionally comprises a cationic deposition polymer. These and other features, aspects, and advantages of the present invention will become evident to those skilled in the art from a reading of the present disclosure. While the specification concludes with claims that particularly point out and distinctly claim the invention, it is believed the present invention will be better understood from the following description. The personal cleansing compositions of the present invention include a detersive surfactant, silicone particles, a protecting agent and an aqueous carrier. Applicants have discovered that large particle size amine functional silicones, provide an improved level of deposition of the amine functional silicone on hair. However, these large particles are usually sheared down during manufacture or use of the product so that their benefit is not achieved. Applicant has discovered that when large particle amine functional silicones are pre-blended with a protecting agent the particles remain stable in the shampoo composition, thereby providing excellent conditioning. Various embodiments of the present invention further address the need for providing improved hair conditioning benefits, including, e.g., dry hair softness, smoothness, hair strand alignment (i.e., minimization of frizzy hair), ease of dry combing and/or a general conditioned hair feel. Each of these essential components, as well as preferred or optional components, are described in detail hereinafter. All percentages are by weight of total composition unless specifically stated otherwise. All ratios are weight ratios unless specifically stated otherwise. Except as otherwise noted, all amounts including quantities, percentages, portions, and proportions, are understood to be modified by the word “about”, and amounts are not intended to indicate significant digits. Herein, “comprising” means that other steps and other ingredients which do not affect the end result can be added. This term encompasses the terms “consisting of” and “consisting essentially of”. The compositions and methods/processes of the present invention can comprise, consist of, and consist essentially of the essential elements and limitations of the invention described herein, as well as any of the additional or optional ingredients, components, steps, or limitations described herein. Herein, “molecular weight” means the weight average MW, and can be measured by gel permeation chromotography (GPC). Herein, “graft” means attached to a backbone at any position other than an end group. Herein, “terminal” means attached to a backbone at an end group. The hair conditioning shampoo composition of the present invention includes a detersive surfactant. The detersive surfactant component is included to provide cleaning performance to the composition. The detersive surfactant component in turn includes anionic detersive surfactant, zwitterionic or amphoteric detersive surfactant, or a combination thereof. Such surfactants should be physically-and chemically compatible with the essential components described herein, or should not otherwise unduly impair product stability, aesthetics or performance. The concentration of the detersive surfactant component in the composition should be sufficient to provide the desired cleaning and lather performance, and generally ranges from about 5% to about 50%, preferably from about 8% to about 30%, more preferably from about 10% to about 25%, even more preferably from about 11% to about 20%. Suitable anionic detersive surfactant components for use in the hair conditioning shampoo composition include those which are known for use in hair care or other personal care cleansing compositions. Preferred anionic surfactants suitable for use in the compositions are the alkyl and alkyl ether sulfates. These materials have the respective formula ROSO3M and RO(C2H4O)xSO3M, wherein R is alkyl or alkenyl of from about 8 to about 18 carbon atoms, x is an integer having a value of from 1 to 10, and M is a cation such as ammonium, alkanolamines, such as triethanolamine, monovalent metals, such as sodium and potassium, and polyvalent metal cations, such as magnesium, and calcium. Preferably, R has from about 8 to about 18 carbon atoms, more preferably from about 10 to about 16 carbon atoms, even more preferably from about 12 to about 14 carbon atoms, in both the alkyl and alkyl ether sulfates. The alkyl ether sulfates are typically made as condensation products of ethylene oxide and monohydric alcohols having from about 8 to about 24 carbon atoms. The alcohols can be synthetic or they can be derived from fats, e.g., coconut oil, palm kernel oil, and tallow. Lauryl alcohol and straight chain alcohols derived from coconut oil or palm kernel oil are preferred. Such alcohols are reacted with between about 0 and about 10, preferably from about 2 to about 5, more preferably about 3, molar proportions of ethylene oxide, and the resulting mixture of molecular species having, for example, an average of 3 moles of ethylene oxide per mole of alcohol, is sulfated and neutralized. 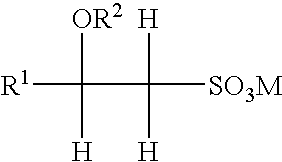 Other suitable anionic detersive surfactants are the water-soluble salts of organic, sulfuric acid reaction products conforming to the formula [R1—SO3-M] where R1 is a straight or branched chain, saturated, aliphatic hydrocarbon radical having from about 8 to about 24, preferably about 10 to about 18, carbon atoms; and M is a cation described hereinbefore. Other suitable anionic detersive surfactants include olefin sulfonates having about 10 to about 24 carbon atoms. In addition to the true alkene sulfonates and a proportion of hydroxy-alkanesulfonates, the olefin sulfonates can contain minor amounts of other materials, such as alkene disulfonates depending upon the reaction conditions, proportion of reactants, the nature of the starting olefins and impurities in the olefin stock and side reactions during the sulfonation process. A non-limiting example of such an alpha-olefin sulfonate mixture is described in U.S. Pat. No. 3,332,880.
where R1 is a straight chain alkyl group having from about 6 to about 20 carbon atoms, R2 is a lower alkyl group having from about 1 to about 3 carbon atoms, preferably 1 carbon atom, and M is a water-soluble cation as described hereinbefore. Preferred anionic detersive surfactants for use in the compositions include ammonium lauryl sulfate, ammonium laureth sulfate, triethylamine lauryl sulfate, triethylamine laureth sulfate, triethanolamine lauryl sulfate, triethanolamine laureth sulfate, monoethanolamine lauryl sulfate, monoethanolamine laureth sulfate, diethanolamine lauryl sulfate, diethanolamine laureth sulfate, lauric monoglyceride sodium sulfate, sodium lauryl sulfate, sodium laureth sulfate, potassium lauryl sulfate, potassium laureth sulfate, sodium lauryl sarcosinate, sodium lauroyl sarcosinate, lauryl sarcosine, cocoyl sarcosine, ammonium cocoyl sulfate, ammonium lauroyl sulfate, sodium cocoyl sulfate, sodium lauroyl sulfate, potassium cocoyl sulfate, potassium lauryl sulfate, triethanolamine lauryl sulfate, triethanolamine lauryl sulfate, monoethanolamine cocoyl sulfate, monoethanolamine lauryl sulfate, sodium tridecyl benzene sulfonate, sodium dodecyl benzene sulfonate, sodium cocoyl isethionate and combinations thereof. Suitable amphoteric or zwitterionic detersive surfactants for use in the composition herein include those which are known for use in hair care or other personal care cleansing. Concentration of such amphoteric detersive surfactants preferably ranges from about 0.5% to about 20%, preferably from about 1% to about 10%. Non-limiting examples of suitable zwitterionic or amphoteric surfactants are described in U.S. Pat. No. 5,104,646 (Bolich Jr. et al. ), U.S. Pat. No. 5,106,609 (Bolich Jr. et al.). Amphoteric detersive surfactants suitable for use in the composition are well known in the art, and include those surfactants broadly described as derivatives of aliphatic secondary and tertiary amines in which the aliphatic radical can be straight or branched chain and wherein one of the aliphatic substituents contains from about 8 to about 18 carbon atoms and one contains an anionic group such as carboxy, sulfonate, sulfate, phosphate, or phosphonate. Preferred amphoteric detersive surfactants for use in the present invention include cocoamphoacetate, cocoamphodiacetate, lauroamphoacetate, lauroamphodiacetate, and mixtures thereof. Zwitterionic detersive surfactants suitable for use in the compositions are well known in the art, and include those surfactants broadly described as derivatives of aliphatic quaternary ammonium, phosphonium, and sulfonium compounds, in which the aliphatic radicals can be straight or branched chain, and wherein one of the aliphatic substituents contains from about 8 to about 18 carbon atoms and one contains an anionic group such as carboxy, sulfonate, sulfate, phosphate or phosphonate. Zwitterionics such as betaines are preferred. The compositions of the present invention may further comprise additional surfactants for use in combination with the anionic detersive surfactant component described hereinbefore. Suitable optional surfactants include nonionic and cationic surfactants. Any such surfactant known in the art for use in hair or personal care products may be used, provided that the optional additional surfactant is also chemically and physically compatible with the essential components of the composition, or does not otherwise unduly impair product performance, aesthetics or stability. The concentration of the optional additional surfactants in the composition may vary with the cleansing or lather performance desired, the optional surfactant selected, the desired product concentration, the presence of other components in the composition, and other factors well known in the art. Non-limiting examples of other anionic, zwitterionic, amphoteric or optional additional surfactants suitable for use in the compositions are described in McCutcheon's, Emulsifiers and Detergents, 2003 Annual, published by M. C. Publishing Co., and U.S. Pat. Nos. 3,929,678, 2,658,072; 2,438,091; 2,528,378. The hair conditioning shampoo composition of the present invention further includes silicone particles. The silicone particles comprise at least one amine functional silicone (“aminosilicone”). In another embodiment, the silicone particles can additionally comprise a non-amine functional silicone (i.e., a silicone which contains no amine functional groups; herein “NAFS”). In such an embodiment, the amine functional silicone and NAFS preferably form emulsion drops or particles containing a blend of both the amine functional silicone and the NAFS. The total concentration of silicone particles in the compositions of the present invention should be sufficient to provide the desired conditioning performance of the shampoo, and generally ranges from about 0.01% to about 10%, preferably from about 0.5% to about 8%, and more preferably from about 1% to about 5%, by weight of the total composition. The silicones used in the present invention have a particle size of from about 3μ to about 1501μ, preferably from about 20μ to about 80μ, more preferably from about 20μ to about 60μ, even more preferably from about 30μ to about 50μ. Some embodiments may preferably further include a deposition aid. Examples of preferred deposition aids are discussed in more detail, below. Particle size may be measured by means of a laser light scattering technique, using a Horiba model LA 910 Laser Scattering Particle Size Distribution Analyzer (Horiba Instruments, Inc. Irvine Calif., USA). The particle size may be measured in shampoo by combining 1.75 g of shampoo with 30 mL 3% NH4Cl, 20 mL 2% Na2HPO4, 45 mL 1% Laureth-7, and 5 mL EDTA (O. iM). This mixture is then heated to 85° C. to remove any crystalline or waxy material. 10-40 mLs are taken while the sample is hot and then injected into the Horiba until the instrument reading is between 90-95%T for particle size measurement. The measurement is taken after 2 minutes of circulation through the instrument. Particle size of the silicone particles prior to inclusion into the shampoo can also be run on the Horiba. The viscosity of silicones discussed herein is measured at 25° C.
Herein “aminosilicone” means any amine functionalized silicone; i.e., a silicone containing at least one primary amine, secondary amine, tertiary amine, or a quaternary ammonium group. Preferred aminosilicones will typically have less than about 0.5% nitrogen by weight of the aminosilicone, more preferably less than about 0.2%, more preferably still, less than about 0.10%. Higher levels of nitrogen (amine functional groups) in the aminosilicone tend to result in both less friction reduction and very low deposition of the aminosilicone to the hair; and consequently, minimal to no conditioning benefit from the aminosilicone component. In a preferred embodiment, the aminosilicone has a viscosity of from about 1,000 cs to about 1,000,000 cs, more preferably 2,000 cs to 600,000 cs, more preferably from about 4,000 cs to about 400,000 cs. Aminosilicones may be graft or terminal. Preferred graft aminosilicones have viscosities of from about 1,000 to about 10,000,000 cs, more preferably from about 5,000 to about 5,000,000 cs, still more preferably from about 10,000 to about 1,000,000 cs. Preferred terminal aminosilicones have viscosities of from about 1,000 to about 1,000,000 cs, more preferably from about 50,000 to about 500,000 cs, still more preferably from about 100,000 to about 400,000 cs. wherein G is hydrogen, phenyl, hydroxy, or C1-C8 alkyl, preferably methyl; a is 0 or an integer having a value from 1 to 3, preferably 1; b is 0, 1 or 2, preferably 1; n is a number from 10 to 1,999, preferably from 49 to 500; m is an integer from 0 to 2,000, preferably from 0 to 10; the sum of n and m is a number from 100 to 2,000, preferably from 400 to 1800; R1 is a monovalent radical conforming to the general formula CqH2qL, wherein q is an integer having a value from 2 to 8 and L is selected from the following groups: —N(R2)CH2—CH2—N(R2)2; —N(R2)2; —N(R2)3A−; —N(R2)CH2—CH2—NR2H2A−; wherein R2 is hydrogen, phenyl, benzyl, or a saturated hydrocarbon radical, preferably an alkyl radical from about C1 to about C20, and A− is a halide ion. A preferred aminosilicone corresponding to formula (II) has m=0, a=1, q=3, n˜1600, and L is —N(CH3)2. In embodiments containing NAFS, the weight ratio of aminosilicone to NAFS is preferably from about 1:99 to about 99:1. Preferably the NAFS has a viscosity of at least about 10,000 cs, more preferably from about 60,000 cs to about 2,000,000 cs, even more preferably from about 100,000 cs to about 500,000 cs. The NAFS component may comprise volatile NAFS, non-volatile NAFS, or combinations thereof. Preferred are non-volatile NAFS. If volatile NAFS are present, it will typically be incidental to their use as a solvent or carrier for commercially available forms of non-volatile NAFS materials ingredients, such as NAFS gums and resins. The NAFS may comprise a silicone fluid conditioning agent and may also comprise other ingredients, such as a NAFS resin to improve silicone fluid deposition efficiency or enhance glossiness of the hair. Non-limiting examples of suitable NAFS, and optional suspending agents for the silicone, are described in U.S. Reissue Pat. No. 34,584, U.S. Pat. No. 5,104,646, and U.S. Pat. No. 5,106,609. Background material on silicones including sections discussing silicone fluids, gums, and resins, as well as manufacture of silicones, are found in Encyclopedia of Polymer Science and Engineering, vol. 15, 2d ed., pp 204-308, John Wiley & Sons, Inc. (1989). Embodiments containing a blend of aminosilicone and NAFS provide several benefits, including improved deposition of the silicone component and improved hair feel over compositions containing NAFS as the sole silicone component. Additionally, as amine functional silicones are generally more expensive than NAFS, compositions containing both materials will generally be less expensive than those containing only amine functional silicones as the silicone component, yet still provide improved hair conditioning versus compositions containing NAFS as the sole silicone component. NAFS fluids include NAFS oils, which are flowable silicone materials having a viscosity, as measured at 25° C., less than 1,000,000 cs, preferably from about 5 cs to about 1,000,000 cs, more preferably from about 100 cs to about 600,000 cs. Suitable NAFS oils for use in the compositions of the present invention include polyalkyl siloxanes, polyaryl siloxanes, polyalkylaryl siloxanes, polyether siloxane copolymers, and mixtures thereof. Other insoluble, non-volatile NAFS fluids having hair conditioning properties may also be used. wherein R is aliphatic, preferably alkyl or alkenyl, or aryl, R can be substituted or unsubstituted, and x is an integer from 1 to about 8,000. Suitable R groups for use in the compositions of the present invention include, but are not limited to: alkoxy, aryloxy, alkylaryl, arylalkyl, arylalkenyl, alkamino, and ether-substituted, hydroxyl-substituted, and halogen-substituted aliphatic and aryl groups. Suitable R groups also include cationic amines and quaternary ammonium groups. Preferred alkyl and alkenyl substituents are C1 to C5 alkyls and alkenyls, more preferably from C1 to C4, more preferably from C1 to C2. The aliphatic portions of other alkyl-, alkenyl-, or alkynyl-containing groups (such as alkoxy, alkaryl, and alkamino) can be straight or branched chains, and are preferably from C1 to C5, more preferably from C1 to C4, even more preferably from C1 to C3, more preferably from C1 to C2. As discussed above, the R substituents can also contain amino functionalities (e.g. alkylamino groups), which can be primary, secondary or tertiary amines or quaternary ammonium. These include mono-, di- and tri- alkylamino and alkoxyamino groups, wherein the aliphatic portion chain length is preferably as described herein. Other NAFS fluids suitable for use in the compositions of the present invention are the insoluble NAFS gums. These gums are polyorganosiloxane materials having a viscosity, as measured at 25° C., of greater than or equal to 1,000,000 cs. NAFS gums are described in U.S. Pat. No. 4,152,416; Noll and Walter, Chemistry and Technology of Silicones, New York: Academic Press (1968); and in General Electric Silicone Rubber Product Data Sheets SE 30, SE 33, SE 54 and SE 76. Specific non-limiting examples of NAFS gums for use in the compositions of the present invention include polydimethylsiloxane, (polydimethylsiloxane) (methylvinylsiloxane) copolymer, poly(dimethylsiloxane) (diphenyl siloxane)(methylvinylsiloxane) copolymer and mixtures thereof. Other non-volatile, insoluble NAFS that are suitable for use in the compositions of the present invention are those known as “high refractive index silicones,” having a refractive index of at least about 1.46, preferably at least about 1.48, more preferably at least about 1.52, more preferably at least about 1.55. The refractive index of the polysiloxane fluid will generally be less than about 1.70, typically less than about 1.60. In this context, polysiloxane “fluid” includes oils as well as gums. wherein R is as defined above, and n is a number from about 3 to about 7, preferably from about 3 to about 5. The high refractive index polysiloxane fluids contain an amount of aryl-containing R substituents sufficient to increase the refractive index to the desired level, which is described herein. Additionally, R and n must be selected so that the material is non-volatile. Aryl-containing substituents include those which contain alicyclic and heterocyclic five and six member aryl rings and those which contain fused five or six member rings. The aryl rings themselves can be substituted or unsubstituted. Generally, the high refractive index polysiloxane fluids will have a degree of aryl-containing substituents of at least about 15%, preferably at least about 20%, more preferably at least about 25%, even more preferably at least about 35%, more preferably at least about 50%. Typically, the degree of aryl substitution will be less than about 90%, more generally less than about 85%, preferably from about 55% to about 80%. Preferred high refractive index polysiloxane fluids have a combination of phenyl or phenyl derivative substituents (more preferably phenyl), with alkyl substituents, preferably C1-C4 alkyl (more preferably methyl) or hydroxyl. When high refractive index NAFS are used in the compositions of the present invention, they are preferably used in solution with a spreading agent, such as a NAFS resin or a surfactant, to reduce the surface tension by a sufficient amount to enhance spreading and thereby enhance the glossiness (subsequent to drying) of hair treated with the compositions. NAFS fluids suitable for use in the compositions of the present invention are disclosed in U.S. Pat. No. 2,826,551, U.S. Pat. No. 3,964,500, U.S. Pat. No. 4,364,837, British Pat. No. 849,433, and Silicon Compounds, Petrarch Systems, Inc. (1984). NAFS resins may be included in the compositions of the present invention. These resins are highly cross-linked polymeric siloxane systems. 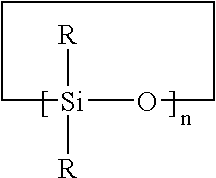 The cross-linking is introduced through the incorporation of trifunctional and tetrafunctional silanes with monofunctional or difunctional, or both, silanes during manufacture of the NAFS resin. NAFS materials and NAFS resins in particular, can conveniently be identified according to a shorthand nomenclature system known to those of ordinary skill in the art as “MDTQ” nomenclature. Under this system, the NAFS is described according to presence of various siloxane monomer units which make up the NAFS . Briefly, the symbol M denotes the monofunctional unit (CH3)3SiO0.5; D denotes the difunctional unit (CH3)2SiO; T denotes the trifunctional unit (CH3)SiO1.5; and Q denotes the quadra- or tetra-functional unit SiO2. Primes of the unit symbols (e.g. M′, D′, T′, and Q′) denote substituents other than methyl, and must be specifically defined for each occurrence. Preferred NAFS resins for use in the compositions of the present invention include, but are not limited to MQ, MT, MTQ, MDT and MDTQ resins. Methyl is a preferred NAFS substituent. Especially preferred silicone resins are MQ resins, wherein the M:Q ratio is from about 0.5:1.0 to about 1.5:1.0 and the average molecular weight of the NAFS resin is from about 1000 to about 10,000. The weight ratio of the non-volatile NAFS fluid, having refractive index below 1.46, to the NAFS resin component, when used, is preferably from about 4:1 to about 400:1, more preferably from about 9:1 to about 200:1, more preferably from about 19:1 to about 100:1, particularly when the NAFS fluid component is a polydimethylsiloxane fluid or a mixture of polydimethylsiloxane fluid and polydimethylsiloxane gum as described herein. Insofar as the silicone resin forms a part of the same phase in the compositions hereof as the silicone fluid, i.e. the conditioning active, the sum of the fluid and resin should be included in determining the level of NAFS conditioning agent in the composition. These include polysaccharides that include polyglucoses, such as starches or celluloses, polygalactomannans such as locust bean gum, guar gum, tara gum, polyglucomannans such as Konjac gum, all of which are hydrophobically modified with substitution containing an R group, where R is a carbon chain of 2-22 carbons in length and is attached to the polysaccharide backbone with an ester or ether linkage or a combination thereof. Examples of this include: Hydroxyethyl-cellulose lauryl-dimonium chlorides (Quatrisoft LM200 available from Dow Chemical) and cetyl hydroxy ethylcellulose (Natrosol Plus, Cellusize HEC QP available from Hercules Corp.), hydroxy propyl cellulose, hydroxypropyl guar, PG-Hydroxyethylcellulose cocodimonium chloride (available from Croda as Crodacel QM). Synthetic polymers are those which are not found naturally but are hydrocarbon based polymers. These materials should be considered polymeric surfactants where the polymer contains a hydrophobic moiety and a hydrophilic moiety. Synthetic polymers of interest include both homopolymers, graft copolymers, block copolymers. One class of materials includes polyethylene oxide (EO) which has been modified with a hydrophobic portion. One example of hydrophobic modification is, polypropylene oxide (PO), where the most common blends are block copolymers. Of greater interest are those polymers whose EO or PO number of repeating units is above 10. Specific examples of these materials include Pluronic L64, Pluronic L77, Pluronic F88, Pluronic 17R2, Pluronic L25R4. Another class of materials is hydrophobically modified polyvinylpyrrolidone(PVP), where one such example is Butylated PVP (Ganex P90 from ISP). Other hydrophobically modified PVP copolymers include Ganex V-216, V220, V516, WP-660 available from ISP. Another class of materials is hydrophilically modified polystyrene (PS). Examples include Sodium Methacrylate/Styrene Copolymers (Lytron 651) Sodium Styrene/Acrylates Copolymer (Lytron 631), Styrene/Acrylamdie Copolymer (Lytron 308), Lyron 284, 288, 2895, 300, 318, 614, 621 all available from Rohm & Haas Company, Inc. Anotherer non-limiting examples of other various polymeric surfactants include, Methyl Vinyl Ether/Maleic Anhydride (PVM MA) Copolymer (Gantrez AN-119, AN-139 AN-149, AN-169, S-95, S-97, M-154) Butyl Esters of PVM/MA copolymers (Gantrz A-524, V-425, ES-425, ES-435) Ethyl Esters of PVM/MA coplymers (Gantrz ES-225 SP-215, V-215, V-225), Isopropyl Esters of PVM/MA (Gantrez ES-335-I) Stearyl vinyl ether/Maleic Anhydride Coplymer (Gantrez AN-8194) all available from ISP. Another non-limiting example includes Diglycol/CHDM/Isophthalates/SIP Copolymer which is a polymer containing diethylene glycol, 1,4-cyclohexanedimethanol and the simple esters of isophthalic acid and sulfoisophthalic acid (available from Eastman Chemical as the Eastman AQ polymer series). Other non-limiting examples of polymeric surfactants are listed in the CTFA International Cosmetic Ingredient Dictionary/Handbook via CTFA Web as well as the C.T.F.A. Cosmetic Ingredient Handbook, Ninth Ed., Cosmetic and Fragrance Assn., Inc., Washington D.C. (2002). Particle Protecting Agents: Particles are also an effective way to protect the silicone particle size by forming a Pickering emulsion. Examples and descriptions follow below: The protecting particles of the present invention preferably have a particle size of less than 300 μm. Typically, the particles will have a particle size from about 0.01 μm to about 80 μm, still more preferably from about 0.1 μm to about 70 μm, and even more preferably from about 1 μm to about 60 μm in diameter. Particles that are generally recognized as safe, and are listed in the CTFA International Cosmetic Ingredient Dictionary/Handbook via CTFA Web as well as the C.T.F.A. Cosmetic Ingredient Handbook, Ninth Ed., Cosmetic and Fragrance Assn., Inc., Washington D.C. (2002), can be used. Particles useful in the present invention can be natural, synthetic, or semi-synthetic in composition. Hybrid particles are also useful. Synthetic particles can made of either cross-linked or non cross-linked polymers. The particles of the present invention can have surface charges or their surface can be modified with organic or inorganic materials such as surfactants, polymers, and inorganic materials. Particle complexes are also useful. Suitable powders include bismuth oxychloride, titanated mica, fumed silica, spherical silica, polymethylmethacrylate, micronized teflon, boron nitride, acrylate polymers, aluminum silicate, aluminum starch octenylsuccinate, bentonite, calcium silicate, cellulose, chalk, corn starch, diatomaceous earth, fuller's earth, glyceryl starch, hectorite, hydrated silica, kaolin, magnesium aluminum silicate, magnesium carbonate, magnesium hydroxide, magnesium oxide, magnesium silicate, magnesium trisilicate, maltodextrin, montmorillonite, microcrystaline cellulose, rice starch, silica, talc, mica, titanium dioxide, zinc laurate, zinc myristate, zinc neodecanoate, zinc rosinate, zinc stearate, polyethylene, alumina, attapulgite, calcium carbonate, calcium silicate, dextran, kaolin, nylon, silica silylate, silk powder, sericite, soy flour, tin oxide, titanium hydroxide, trimagnesium phosphate, walnut shell powder, or mixtures thereof. The above mentioned powders may be surface treated with lecithin, amino acids, mineral oil, silicone oil, or various other agents either alone or in combination, which coat the powder surface and render the particles hydrophobic in nature. Non limiting examples of natural particles include various precipitated silica particles in hydrophilic and hydrophobic forms available from Degussa-Huls under the trade name Sipernet. Snowtex colloidal silica particles available from Nissan Chemical America Corporation. Examples of synthetic particles include nylon, silicone resins, poly(meth)acrylates, polyethylene, polyester, polypropylene, polystyrene, polyurethane, polyamide, epoxy resins, urea resins, and acrylic powders. Non liniting examples of useful particles are Microease 110S, 114S, 116 (micronized synthetic waxes), Micropoly 210, 250S (micronized polyethylene), Microslip (micronized polytetrafluoroethylene), and Microsilk (combination of polyethylene and polytetrafluoroethylene), all of which are available from Micro Powder, Inc. Other examples include Luna (smooth silica particles) particles available from Phenomenex, MP-2200 (polymethylmethacrylate), EA-209 (ethylene/acrylate copolymer), SP-501(nylon-12), ES-830 (polymethly methacrylate), BPD-800, BPD-500 (polyurethane) particles available from Kobo Products, Inc. and silicone resins sold under the name Tospearl particles by GE Silicones or a high molecular weight silicone resin such as DC HMW 2220. Ganzpearl GS-0605 crosslinked polystyrene (available from Presperse) is also useful. Non limiting examples of hybrid particles include Ganzpearl GSC-30SR (Sericite & crosslinked polystyrene hybrid powder), and SM-1000, SM-200 (mica and silica hybrid powder available from Presperse). In one embodiment of the present invention, the particles are hollow particles. In a preferred embodiment, the hollow particles are fluid-encapsulated, flexible microspheres. The microspheres are structurally hollow, however, they may contain various fluids, which encompass liquids and gases and their isomers. The gases include, but not limited to, butane, pentane, air, nitrogen, oxygen, carbon dioxide, and dimethyl ether. If used, liquids may only partially fill the microspheres. The liquids include water and any compatible solvent. The particles of the present invention can have surface charges or their surface can be modified with organic or inorganic materials such as surfactants, polymers, and inorganic materials. Particle complexes are also useful. Non-limiting examples of complexes of gas-encapsulated microspheres are DSPCS-I2™ (silica modified ethylene/methacrylate copolymer microsphere) and SPCAT-I2™ (talc modified ethylene/methacrylate copolymer microsphere). Both of these are available from Kobo Products, Inc. The surface of the particle may be charged through a static development or with the attachment of various ionic groups directly or linked via short, long or branched alkyl groups. The surface charge can be anionic, cationic, zwitterionic or amphoteric in nature. The wall of the particles of the present invention may be formed from a thermoplastic material. The thermoplastic material may be a polymer or copolymer of at least one monomer selected from the following groups: acrylates, methacrylates, styrene, substituted styrene, unsaturated dihalides, acrylonitriles, methacrylonitrile. The thermoplastic materials may contain amide, ester, urethane, urea, ether, carbonate, acetal, sulfide, phosphate, phosphonate ester, and siloxane linkages. The hollow particles may comprise from 1% to 60% of recurring structural units derived from vinylidene chloride, from 20% to 90% of recurring structural units derived from acrylonitrile and from 1% to 50% of recurring structural units derived from a (meth)acrylic monomer, the sum of the percentages (by weight) being equal to 100. The (meth)acrylic monomer is, for example, a methyl acrylate or methacrylate, and especially the methacrylate. Preferably, the particles are comprised of a polymer or copolymer of at least one monomer selected from expanded or non-expanded vinylidene chloride, acrylic, styrene, and (meth)acrylonitrile. More preferably, the particles are comprised of a copolymer of acrylonitrile and methacrylonitrile. Particles comprised of polymers and copolymers obtained from esters, such as, for example, vinyl acetate or lactate, or acids, such as, for example, itaconic, citraconic, maleic or fumaric acids may also be used. See, in this regard, Japanese Patent Application No. JP-A-2-112304, the full disclosure of which is incorporated herein by reference. Non-limiting examples of commercially available suitable particles are 551 DE (particle size range of approximately 30-50 μm and density of approximately 42 kg/m3), 551 DE 20 (particle size range of approximately 15-25 μm and density of approximately 60 kg/m3), 461 DE (particle size range of approximately 20-40 μm and density 60 kg/m3), 551 DE 80 (particle size of approximately 50-80 μm and density of approximately 42 kg/m3 ), 091 DE (particle size range of approximately 35-55 μm and density of approximately 30 kg/m3), all of which are marketed under the trademark EXPANCEL™ by Akzo Nobel. Other examples of suitable particles for use herein are marketed under the trademarks DUALITE® and MICROPEARL™ series of microspheres from Pierce & Stevens Corporation. Particularly preferred hollow particles are 091 DE and 551DE 50. The hollow particles of the present invention exist in either dry or hydrated state. The aforesaid particles are nontoxic and non irritating to the skin. Hollow particles that are useful in the invention can be prepared, for example, via the processes described in EP-56,219,EP-348,372, EP-486,080, EP-320,473, EP-112,807 and U.S. Pat. No. 3,615,972, the full disclosure of each of which is incorporated herein by reference. Alternatively, the wall of the hollow particles useful in the present invention may be formed from an inorganic material. The inorganic material may be a silica, a soda-lime-borosilicate glass, a silica-alumina ceramic, or an alkali alumino silicate ceramic. Non-limiting examples of commercially available suitable low density, inorganic particles are H50/10,000 EPX (particle size range approximately 20-60 em), S38 (particle size range approximately 15-65 μm), W-210 (particle size range approximately 1-12 μm), W-410 (particle size range approximately 1-24 μm), W-610 (particle size range approximately 1-40 μm), G-200 (particle size range approximately 1-12 μm), G-400 (particle size range approximately 1-24 μm), G-600 (particle size range approximately 1-40 μm), all of which are marketed under the trademarks 3M™ Scotchlite™ Glass Bubbles, 3M™ Zeeospheres™ ceramic microspheres, and 3M™ Z-Light Spheres™ Ceramic Microspheres. Also useful are Silica shells (average particle size 3 μm) available from KOBO Products and LUXSIL™ (3-13 μm mean diameter) available from PQ Corporation. Preferred embodiments of the present invention are in the form of pourable liquids (under ambient conditions). Such compositions will therefore typically comprise an aqueous carrier, which is present at a level of from about 20% to about 95%, more preferably from about 60% to about 85%. The aqueous carrier may comprise water, or a miscible mixture of water and organic solvent, but preferably comprises water with minimal or no significant concentrations of organic solvent, except as otherwise incidentally incorporated into the composition as minor ingredients of other essential or optional components. It is within the scope of the present invention that some embodiments of the conditioning shampoo composition may further include a deposition aid. Herein, “deposition aid” means an agent which enhances deposition of the silicone particles from the conditioning shampoo composition onto the intended site during use, i.e., the hair and/or scalp. Preferred embodiments include from about 0.01 to about 10% deposition aid, more preferably, more preferably from about 0.1 to about 2%. The deposition aid is preferably a cationic polymer. Preferred hair conditioning shampoo composition embodiments preferably have from 0.05% to about 3% cationic polymer, more preferably from about 0.075% to about 2.0%, more preferably from about 0.1% to about 1.0%. Preferred cationic polymers will have cationic charge densities of at from about 0.5 meq/gm, to about 7 meq/gm, at the pH of intended use of the composition, which pH will generally range from about pH 3 to about pH 9. Herein, “cationic charge density” of a polymer refers to the ratio of the number of positive charges on the polymer to the molecular weight of the polymer. The average molecular weight of such suitable cationic polymers will generally be between about 10,000 and 10 million, preferably between about 50,000 and about 5 million, more preferably between about 100,000 and about 3 million. Suitable cationic polymers for use in the compositions of the present invention contain cationic nitrogen-containing moieties such as quaternary ammonium or cationic protonated amino moieties. The cationic protonated amines can be primary, secondary, or tertiary amines (preferably secondary or tertiary), depending upon the particular species and the selected pH of the composition. Any anionic counterions can be used in association with the cationic polymers so long as the polymers remain soluble in water, in the composition, or in a coacervate phase of the composition, and so long as the counterions are physically and chemically compatible with the essential components of the composition or do not otherwise unduly impair product performance, stability or aesthetics. Non-limiting examples of such counterions include halides (e.g., chloride, fluoride, bromide, iodide), sulfate and methylsulfate. Non-limiting examples of such polymers are described in the CTFA International Cosmetic Ingredient Dictionary/Handbook via CTFA Web as well as the C.T.F.A. Cosmetic Ingredient Handbook, Ninth Ed., Cosmetic and Fragrance Assn., Inc., Washington D.C. (2002), incorporated herein by reference, can be used. Non-limiting examples of suitable cationic polymers include copolymers of vinyl monomers having cationic protonated amine or quaternary ammonium functionalities with water soluble spacer monomers such as acrylamide, methacrylamide, alkyl and dialkyl acrylamides, alkyl and dialkyl methacrylamides, alkyl acrylate, alkyl methacrylate, vinyl caprolactone or vinyl pyrrolidone. Suitable cationic protonated amino and quaternary ammonium monomers, for inclusion in the cationic polymers of the composition herein, include vinyl compounds substituted with dialkylaminoalkyl acrylate, dialkylaminoalkyl methacrylate, monoalkylaminoalkyl acrylate, monoalkylaminoalkyl methacrylate, trialkyl methacryloxyalkyl ammonium salt, trialkyl acryloxyalkyl ammonium salt, diallyl quaternary ammonium salts, and vinyl quaternary ammonium monomers having cyclic cationic nitrogen-containing rings such as pyridinium, imidazolium, and quaternized pyrrolidone, e.g., alkyl vinyl imidazolium, alkyl vinyl pyridinium, alkyl vinyl pyrrolidone salts. wherein R1 is hydrogen, methyl or ethyl; each of R2, R3 and R4 are independently hydrogen or a short chain alkyl having from about 1 to about 8 carbon atoms, preferably from about 1 to about 5 carbon atoms, more preferably from about 1 to about 2 carbon atoms; n is an integer having a value of from about 1 to about 8, preferably from about 1 to about 4; and X is a counterion. 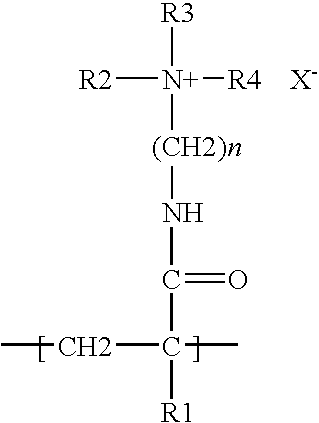 The nitrogen attached to R2, R3 and R4 may be a protonated amine (primary, secondary or tertiary), but is preferably a quatemary ammonium wherein each of R2, R3 and R4 are alkyl groups a non limiting example of which is polymethyacrylamidopropyl trimonium chloride, available under the trade name Polycare 133, from Rhone-Poulenc, Cranberry, N.J., U.S.A. Also preferred are copolymers of this cationic monomer with nonionic monomers such that the cationic charge density of the copolymer remains in the range specified above. wherein A is an anhydroglucose residual group, such as a starch or cellulose anhydroglucose residual; R is an alkylene oxyalkylene, polyoxyalkylene, or hydroxyalkylene group, or combination thereof; R1, R2, and R3 independently are alkyl, aryl, alkylaryl, arylalkyl, alkoxyalkyl, or alkoxyaryl groups, each group containing up to about 18 carbon atoms, and the total number of carbon atoms for each cationic moiety (i.e., the sum of carbon atoms in R1, R2 and R3) preferably being about 20 or less; and X is an anionic counterion as described in hereinbefore. Preferred cationic cellulose polymers are salts of hydroxyethyl cellulose reacted with trimethyl ammonium substituted epoxide, referred to in the industry (CTFA) as Polyquaternium 10 and available from Amerchol Corp. (Edison, N.J., USA) in their Polymer LR, JR, and KG series of polymers. Other suitable types of cationic cellulose includes the polymeric quaternary ammonium salts of hydroxyethyl cellulose reacted with lauryl dimethyl ammonium-substituted epoxide referred to in the industry (CTFA) as Polyquaternium 24. These materials are available from Amerchol Corp. under the tradename Polymer LM-200. Other suitable cationic polymers include cationic guar gum derivatives, such as guar hydroxypropyltrimonium chloride, specific examples of which include the Jaguar series commercially available from Rhone-Poulenc Incorporated and the N-Hance series commercially available from Aqualon Division of Hercules, Inc. Other suitable cationic polymers include quaternary nitrogen-containing cellulose ethers, some examples of which are described in U.S. Pat. No. 3,962,418. Other suitable cationic polymers include copolymers of etherified cellulose, guar and starch, some examples of which are described in U.S. Pat. No. 3,958,581. When used, the cationic polymers herein are either soluble in the composition or are soluble in a complex coacervate phase in the composition formed by the cationic polymer and the anionic, amphoteric and/or zwitterionic detersive surfactant component described hereinbefore. Complex coacervates of the cationic polymer can also be formed with other charged materials in the composition. Techniques for analysis of formation of complex coacervates are known in the art. For example, microscopic analyses of the compositions, at any chosen stage of dilution, can be utilized to identify whether a coacervate phase has formed. Such coacervate phase will be identifiable as an additional emulsified phase in the composition. The use of dyes can aid in distinguishing the coacervate phase from other insoluble phases dispersed in the composition. Certain embodiments of the hair conditioning shampoo composition of the present invention may further include one or more optional components known for use in hair care or personal care products, provided that the optional components are physically and chemically compatible with the essential components described herein, or do not otherwise unduly impair product stability, aesthetics or performance. Individual concentrations of such optional components may range from about 0.001% to about 20%. Non-limiting examples of optional components for use in the composition include dispersed particles, cationic polymers, other conditioning agents (hydrocarbon oils, fatty esters, other silicones), anti dandruff/anti-microbial agents, suspending agents, viscosity modifiers, dyes, nonvolatile solvents or diluents (water soluble and insoluble), pearlescent aids, foam boosters, additional surfactants or nonionic cosurfactants, pH adjusting agents, perfumes, preservatives, chelants, proteins, skin active agents, sunscreens, UV absorbers, and vitamins. The compositions of the present invention may include dispersed particles. In the compositions of the present invention, it is preferable to incorporate at least 0.025% by weight of the dispersed particles, more preferably at least 0.05%, still more preferably at least 0.1%, even more preferably at least 0.25%, and yet more preferably at least 0.5% by weight of the dispersed particles. In the compositions of the present invention, it is preferable to incorporate no more than about 20% by weight of the dispersed particles, more preferably no more than about 10%, still more preferably no more than 5%, even more preferably no more than 3%, and yet more preferably no more than 2% by weight of the dispersed particles. wherein R95 is selected from the group consisting of H, methyl, and mixtures thereof. Polyethylene glycol polymers useful herein are PEG-2M (also known as Polyox WSR® N-10, which is available from Union Carbide and as PEG-2,000); PEG-5M (also known as Polyox WSR® N-35 and Polyox WSR® N-80, available from Union Carbide and as PEG-5,000 and Polyethylene Glycol 300,000); PEG-7M (also known as Polyox WSR® N-750 available from Union Carbide); PEG-9M (also known as Polyox WSR® N-3333 available from Union Carbide); and PEG-14 M (also known as Polyox WSR® N-3000 available from Union Carbide). Conditioning agents include any material which is used to give a particular conditioning benefit to hair and/or skin. In hair treatment compositions, suitable conditioning agents are those which deliver one or more benefits relating to shine, softness, combability, antistatic properties, wet-handling, damage, manageability, body, and greasiness. Conditioning agents (in addition to the aminosilicones and NAFS described above) useful in the compositions of the present invention typically comprise a water insoluble, water dispersible, non-volatile, liquid that forms emulsified, liquid particles. Suitable conditioning agents for use in the composition are those conditioning agents characterized generally as organic conditioning oils (e.g., hydrocarbon oils, polyolefins, and fatty esters), or those conditioning agents which otherwise form liquid, dispersed particles in the aqueous surfactant matrix herein. Such conditioning agents should be physically and chemically compatible with the essential components of the composition, and should not otherwise unduly impair product stability, aesthetics or performance. The concentration of such other conditioning agent in the composition should be sufficient to provide the desired conditioning benefits, and as will be apparent to one of ordinary skill in the art. Such concentration can vary with the conditioning agent, the conditioning performance desired, the average size of the conditioning agent particles, the type and concentration of other components, and other like factors. The conditioning component of the compositions of the present invention may also comprise from about 0.05% to about 3%, preferably from about 0.08% to about 1.5%, more preferably from about 0.1% to about 1%, of at least one organic conditioning oil as the conditioning agent, either alone or in combination with other conditioning agents, such as the silicones (described herein). Suitable organic conditioning oils for use as conditioning agents in the compositions of the present invention include, but are not limited to, hydrocarbon oils having at least about 10 carbon atoms, such as cyclic hydrocarbons, straight chain aliphatic hydrocarbons (saturated or unsaturated), and branched chain aliphatic hydrocarbons (saturated or unsaturated), including polymers and mixtures thereof. Straight chain hydrocarbon oils preferably are from about C12 to about C19. Branched chain hydrocarbon oils, including hydrocarbon polymers, typically will contain more than 19 carbon atoms. Specific non-limiting examples of these hydrocarbon oils include paraffin oil, mineral oil, saturated and unsaturated dodecane, saturated and unsaturated tridecane, saturated and unsaturated tetradecane, saturated and unsaturated pentadecane, saturated and unsaturated hexadecane, polybutene, polydecene, and mixtures thereof. Branched-chain isomers of these compounds, as well as of higher chain length hydrocarbons, can also be used, examples of which include highly branched, saturated or unsaturated, alkanes such as the permethyl-substituted isomers, e.g., the permethyl-substituted isomers of hexadecane and eicosane, such as 2, 2, 4, 4, 6, 6, 8, 8-dimethyl-10-methylundecane and 2, 2, 4, 4, 6, 6-dimethyl-8-methylnonane, available from Permethyl Corporation. Hydrocarbon polymers such as polybutene and polydecene. A preferred hydrocarbon polymer is polybutene, such as the copolymer of isobutylene and butene. A commercially available material of this type is L-14 polybutene from Amoco Chemical Corporation. The concentration of such hydrocarbon oils in the composition preferably range from about 0.05% to about 20%, more preferably from about 0.08% to about 1.5%, and even more preferably from about 0.1% to about 1%. Organic conditioning oils for use in the compositions of the present invention can also include liquid polyolefins, more preferably liquid poly-α-olefins, more preferably hydrogenated liquid poly-α-olefins. Polyolefins for use herein are prepared by polymerization of C4 to about C14 olefenic monomers, preferably from about C6 to about C12. Non-limiting examples of olefenic monomers for use in preparing the polyolefin liquids herein include ethylene, propylene, 1-butene, 1-pentene, 1-hexene, 1-octene, 1-decene, 1-dodecene, 1-tetradecene, branched chain isomers such as 4-methyl-1-pentene, and mixtures thereof. Also suitable for preparing the polyolefin liquids are olefin-containing refinery feedstocks or effluents. Preferred hydrogenated α-olefin monomers include, but are not limited to: 1-hexene to 1-hexadecenes, 1-octene to 1-tetradecene, and mixtures thereof. Other suitable organic conditioning oils for use as the conditioning agent in the compositions of the present invention include, but are not limited to, fatty esters having at least 10 carbon atoms. These fatty esters include esters with hydrocarbyl chains derived from fatty acids or alcohols (e.g. mono-esters, polyhydric alcohol esters, and di- and tri-carboxylic acid esters). The hydrocarbyl radicals of the fatty esters hereof may include or have covalently bonded thereto other compatible functionalities, such as amides and alkoxy moieties (e.g., ethoxy or ether linkages, etc.). Specific examples of preferred fatty esters include, but are not limited to: iso-propyl isostearate, hexyl laurate, isohexyl laurate, isohexyl palmitate, isopropyl palmitate, decyl oleate, isodecyl oleate, hexadecyl stearate, decyl stearate, isopropyl isostearate, dihexyldecyl adipate, lauryl lactate, myristyl lactate, cetyl lactate, oleyl stearate, oleyl oleate, oleyl myristate, lauryl acetate, cetyl propionate, and oleyl adipate. Other fatty esters suitable for use in the compositions of the present invention are mono-carboxylic acid esters of the general formula R′COOR, wherein R′ and R are alkyl or alkenyl radicals, and the sum of carbon atoms in R′ and R is at least 10, preferably at least 22. Still other fatty esters suitable for use in the compositions of the present invention are di- and tri-alkyl and alkenyl esters of carboxylic acids, such as esters of C4 to C8 dicarboxylic acids (e.g. C1 to C22 esters, preferably C1 to C6, of succinic acid, glutaric acid, and adipic acid). Specific non-limiting examples of di- and tri- alkyl and alkenyl esters of carboxylic acids include isocetyl stearyol stearate, diisopropyl adipate, and tristearyl citrate. Other fatty esters suitable for use in the compositions of the present invention are those known as polyhydric alcohol esters. Such polyhydric alcohol esters include alkylene glycol esters, such as ethylene glycol mono and di-fatty acid esters, diethylene glycol mono- and di-fatty acid esters, polyethylene glycol mono- and di-fatty acid esters, propylene glycol mono- and di-fatty acid esters, polypropylene glycol monooleate, polypropylene glycol 2000 monostearate, ethoxylated propylene glycol monostearate, glyceryl mono- and di-fatty acid esters, polyglycerol poly-fatty acid esters, ethoxylated glyceryl monostearate, 1,3-butylene glycol monostearate, 1,3-butylene glycol distearate, polyoxyethylene polyol fatty acid ester, sorbitan fatty acid esters, and polyoxyethylene sorbitan fatty acid esters. Still other fatty esters suitable for use in the compositions of the present invention are glycerides, including, but not limited to, mono-, di-, and tri-glycerides, preferably di- and tri-glycerides, more preferably triglycerides. For use in the compositions described herein, the glycerides are preferably the mono-, di-, and tri-esters of glycerol and long chain carboxylic acids, such as C10 to C22 carboxylic acids. A variety of these types of materials can be obtained from vegetable and animal fats and oils, such as castor oil, safflower oil, cottonseed oil, corn oil, olive oil, cod liver oil, almond oil, avocado oil, palm oil, sesame oil, lanolin and soybean oil. Synthetic oils include, but are not limited to, triolein and tristearin glyceryl dilaurate. wherein R2 is a C8 to C10 alkyl, alkenyl, hydroxyalkyl or hydroxyalkenyl group; preferably a saturated alkyl group, more preferably a saturated, linear, alkyl group; n and Y are as defined above in Formula (X). Specific non-limiting examples of suitable synthetic fatty esters for use in the compositions of the present invention include: P-43 (C8-C10 triester of trimethylolpropane), MCP-684 (tetraester of 3,3 diethanol-1,5 pentadiol), MCP 121 (C8-C10 diester of adipic acid), all of which are available from Mobil Chemical Company. Also suitable for use in the compositions herein are the conditioning agents described by the Procter & Gamble Company in U.S. Pat. Nos. 5,674,478, and 5,750,122. Also suitable for use herein are those conditioning agents described in U.S. Pat. No. 4,529,586 (Clairol), U.S. Pat. No. 4,507,280 (Clairol), U.S. Pat. No. 4,663,158 (Clairol), U.S. Pat. No. 4,197,865 (L'Oreal), 4,217, 914 (L'Oreal), U.S. Pat. No. 4,381,919 (L'Oreal), and U.S. Pat. No. 4,422, 853 (L'Oreal). The compositions of the present invention may also contain an anti-dandruff agent. Pyridinethione anti-microbial and anti-dandruff agents are described, for example, in U.S. Pat. No. 2,809,971; U.S. Pat. No. 3,236,733; U.S. Pat. No. 3,753,196; U.S. Pat. No. 3,761,418; U.S. Pat. No. 4,345,080; U.S. Pat. No. 4,323,683; U.S. Pat. No. 4,379,753; and U.S. Pat. No. 4,470,982. The compositions of the present invention may further include one or more anti-fungal or anti-microbial actives in addition to the metal pyrithione salt actives. Suitable anti-microbials include itraconazole, ketoconazole, selenium sulfide and coal tar. Especially suitable herein are climbazole and ketoconazole. Selenium sulfide is a particulate anti-dandruff agent suitable for use in the anti-microbial compositions of the present invention, effective concentrations of which range from about 0.1% to about 4%, by weight of the composition, preferably from about 0.3% to about 2.5%, more preferably from about 0.5% to about 1.5%. Selenium sulfide compounds are described, for example, in U.S. Pat. No. 2,694,668; U.S. Pat. No. 3,152,046; U.S. Pat. No. 4,089,945; and U.S. Pat. No. 4,885,107. Sulfur may also be used as a particulate anti-microbial/anti-dandruff agent in the anti-microbial compositions of the present invention. Effective concentrations of the particulate sulfur are typically from about 1% to about 4%, by weight of the composition, preferably from about 2% to about 4%. The present invention may further comprise one or more keratolytic agents such as Salicylic Acid. Additional anti-microbial actives of the present invention may include extracts of melaleuca (tea tree) and charcoal. The present invention may further comprise materials useful for hair loss prevention and hair growth stimulants or agents. The compositions of the present invention may contain a humectant. The humectants herein are selected from the group consisting of polyhydric alcohols, water soluble alkoxylated nonionic polymers, and mixtures thereof. The humectants, when used herein, are preferably used at levels of from about 0.1% to about 20%, more preferably from about 0.5% to about 5%. Polyhydric alcohols useful herein include glycerin, sorbitol, propylene glycol, butylene glycol, hexylene glycol, ethoxylated glucose, 1,2-hexane diol, hexanetriol, dipropylene glycol, erythritol, trehalose, diglycerin, xylitol, maltitol, maltose, glucose, fructose, sodium chondroitin sulfate, sodium hyaluronate, sodium adenosine phosphate, sodium lactate, pyrrolidone carbonate, glucosamine, cyclodextrin, and mixtures thereof. Water soluble alkoxylated nonionic polymers useful herein include polyethylene glycols and polypropylene glycols having a molecular weight of up to about 1000 such as those with CTFA names PEG-200, PEG-400, PEG-600, PEG-1000, and mixtures thereof. The compositions of the present invention may further comprise a suspending agent at concentrations effective for suspending water-insoluble material in dispersed form in the compositions or for modifying the viscosity of the composition. Such concentrations range from about 0.1% to about 10%, preferably from about 0.3% to about 5.0%. Suspending agents useful herein include anionic polymers and nonionic polymers. Useful herein are vinyl polymers such as cross linked acrylic acid polymers with the CTFA name Carbomer, cellulose derivatives and modified cellulose polymers such as methyl cellulose, ethyl cellulose, hydroxyethyl cellulose, hydroxypropyl methyl cellulose, nitro cellulose, sodium cellulose sulfate, sodium carboxymethyl cellulose, crystalline cellulose, cellulose powder, polyvinylpyrrolidone, polyvinyl alcohol, guar gum, hydroxypropyl guar gum, xanthan gum, arabia gum, tragacanth, galactan, carob gum, guar gum, karaya gum, carragheenin, pectin, agar, quince seed (Cydonia oblonga Mill), starch (rice, corn, potato, wheat), algae colloids (algae extract), microbiological polymers such as dextran, succinoglucan, pulleran, starch-based polymers such as carboxymethyl starch, methylhydroxypropyl starch, alginic acid-based polymers such as sodium alginate, alginic acid propylene glycol esters, acrylate polymers such as sodium polyacrylate, polyethylacrylate, polyacrylamide, polyethyleneimine, and inorganic water soluble material such as bentonite, aluminum magnesium silicate, laponite, hectonite, and anhydrous silicic acid. Commercially available viscosity modifiers highly useful herein include Carbomers with tradenames Carbopol 934, Carbopol 940, Carbopol 950, Carbopol 980, and Carbopol 981, all available from B. F. Goodrich Company, acrylates/steareth-20 methacrylate copolymer with tradename ACRYSOL 22 available from Rohm and Hass, nonoxynyl hydroxyethylcellulose with tradename AMERCELL POLYMER HM-1500 available from Amerchol, methylcellulose with tradename BENECEL, hydroxyethyl cellulose with tradename NATROSOL, hydroxypropyl cellulose with tradename KLUCEL, cetyl hydroxyethyl cellulose with tradename POLYSURF 67, all supplied by Hercules, ethylene oxide and/or propylene oxide based polymers with tradenames CARBOWAX PEGs, POLYOX WASRs, and UCON FLUIDS, all supplied by Amerchol. Other optional suspending agents include crystalline suspending agents which can be categorized as acyl derivatives, long chain amine oxides, and mixtures thereof. These suspending agents are described in U.S. Pat. No. 4,741,855. These preferred suspending agents include ethylene glycol esters of fatty acids preferably having from about 16 to about 22 carbon atoms. More preferred are the ethylene glycol stearates, both mono and distearate, but particularly the distearate containing less than about 7% of the mono stearate. Other suitable suspending agents include alkanol amides of fatty acids, preferably having from about 16 to about 22 carbon atoms, more preferably about 16 to 18 carbon atoms, preferred examples of which include stearic monoethanolamide, stearic diethanolamide, stearic monoisopropanolamide and stearic monoethanolamide stearate. Other long chain acyl derivatives include long chain esters of long chain fatty acids (e.g., stearyl stearate, cetyl palmitate, etc. ); long chain esters of long chain alkanol amides (e.g., stearamide diethanolamide distearate, stearamide monoethanolamide stearate); and glyceryl esters (e.g., glyceryl distearate, trihydroxystearin, tribehenin) a commercial example of which is Thixin R available from Rheox, Inc. Long chain acyl derivatives, ethylene glycol esters of long chain carboxylic acids, long chain amine oxides, and alkanol amides of long chain carboxylic acids in addition to the preferred materials listed above may be used as suspending agents. Other long chain acyl derivatives suitable for use as suspending agents include N,N-dihydrocarbyl amido benzoic acid and soluble salts thereof (e.g., Na, K), particularly N,N-di(hydrogenated) C.sub.16, C.sub.18 and tallow amido benzoic acid species of this family, which are commercially available from Stepan Company (Northfield, Illinois, USA). Examples of suitable long chain amine oxides for use as suspending agents include alkyl dimethyl amine oxides, e.g., stearyl dimethyl amine oxide. Other suitable suspending agents include primary amines having a fatty alkyl moiety having at least about 16 carbon atoms, examples of which include palmitamine or stearamine, and secondary amines having two fatty alkyl moieties each having at least about 12 carbon atoms, examples of which include dipalmitoylamine or di(hydrogenated tallow)amine. Still other suitable suspending agents include di(hydrogenated tallow)phthalic acid amide, and crosslinked maleic anhydride-methyl vinyl ether copolymer. The compositions of the present invention may contain also vitamins and amino acids such as: water soluble vitamins such as vitamin B1, B2, B6, B12, C, pantothenic acid, pantothenyl ethyl ether, panthenol, biotin, and their derivatives, water soluble amino acids such as asparagine, alanin, indole, glutamic acid and their salts, water insoluble vitamins such as vitamin A, D, E, and their derivatives, water insoluble amino acids such as tyrosine, tryptamine, and their salts. The compositions of the present invention may also contain pigment materials such as inorganic, nitroso, monoazo, disazo, carotenoid, triphenyl methane, triaryl methane, xanthene, quinoline, oxazine, azine, anthraquinone, indigoid, thionindigoid, quinacridone, phthalocianine, botanical, natural colors, including: water soluble components such as those having C. I. Names. The compositions of the present invention may also contain chelating agents. Another embodiment of the present invention relates to a method of making a conditioning shampoo composition, comprising the steps of combining a) the silicone particles, water, the protecting agent and optionally an emulsifier; (In some embodiments, a separate emulsifier is not required as the protecting agent serves as both the emulsifier and protecting agent.) b) mixing the combination from step a) until the desired particle size is achieved (i.e. ≧3μ); c) optionally adjusting the viscosity of the combination prior to incorporation into the shampoo composition in order to more closely match the viscosity of the shampoo for ease of mixing; and d) mixing to achieve a homogeneous composition. Samples can be viewed by standard light microscopy with particle sizes measured by the Horiba Light Scattering Laser both after 24 hours to allow the system to reach equilibrium. The following examples further describe and demonstrate the preferred embodiments within the scope of the present invention. The examples are given solely for the purpose of illustration, and are not to be construed as limitations of the present invention since many variations thereof are possible without departing from its scope. Emulsion of silicone particles and protecting agent can be made as follows: combine 10-15 % Water with 1-5% Plantaren 2000 and 1-5% Abil EM97. Add 75-90% aminosilicone and mix with an impeller mixer for 30 minutes at 450 rpm. Prior to incorporation into the shampoo, dilute the emulsion with 70% water. Mix for 10-20 minutes until homogeneous. The following examples further describe and demonstrate the preferred embodiments within the scope of the present invention. The examples are given solely for the purpose of illustration, and are not to be construed as limitations of the present invention since many variations thereof are possible without departing from its scope. 1Available from GE Silicones as 1211-02-203. 2Available from GE Silicones as Viscasil 330M from GE Silicones. 8Available from Dow Corning as Dow Corning DC193 Fluid. 9Available from Degussa as Abil EM97. 13Available from Hercules Incoporated as Natrosol Plus CS Modified Hydroxyethyl cellulose. Examples 14-52 illustrate non-limiting conditioning shampoo composition embodiments of the present invention. These compositions are prepared by conventional formulation and mixing methods, an example of which is set forth, below. All exemplified amounts are listed as weight percents and exclude minor materials such as diluents, filler, and the like, unless otherwise specified. The listed formulations, therefore, comprise the listed components and any minor materials associated with such components. The compositions illustrated in Examples 14-52 are prepared in the following manner. For each of the compositions, 6-9% of sodium or ammonium laureth-3 sulfate, and 0-5% water is added to a jacketed mix tank and heated to about 74° C. with agitation to form a solution. Citric acid, sodium citrate, sodium benzoate, disodium EDTA, 0-0.8% Cocamide MEA and 0-0.9% cetyl alcohol, are added to the tank and allowed to disperse. Ethylene glycol distearate (EGDS) is then added to the mixing vessel, and melted. After the EGDS is well dispersed (after about 10 minutes) preservative is added and mixed into the surfactant solution. This mixture is passed through a mill and heat exchanger where it is cooled to about 35° C. and collected in a finishing tank. As a result of this cooling step, the ethylene glycol distearate crystallizes to form a crystalline network in the product (where applicable). The remainder of the sodium or ammonium laureth sulfate and other components, except the silicone emulsion, are added to the finishing tank with agitation to ensure a homogeneous mixture. Polymers (cationic or nonionic) are dispersed in water or oils as an about 0.1% to about 10% dispersion and/or solution and then added to the final mix. The silicone emulsion is added based on the description from above and any additional viscosity and pH modifiers may be added, as needed, to the mixture to adjust product viscosity and pH to the extent desired. 17Available from Aqualon as N-Hance 3269 and ADPP-5043. 18Available from Rhodia as Mirapol 100. 19Available from Rhodia as MAPTAC. All documents cited in the Detailed Description of the Invention are, are, in relevant part, incorporated herein by reference; the citation of any document is not to be construed as an admission that it is prior art with respect to the present invention. 2. A composition according to claim 1, wherein the amine functional silicone has an average particle size of from about 20 microns to about 60 microns. 3. A composition according to claim 1, wherein the amine functional silicone has an average particle size of from about 30 microns to about 50 microns. 4. A composition according to claim 1 wherein the protecting agent is selected from the group consisting of natural polymers, synthetic polymers, silicone copolyols, particles and mixtures thereof or combinations of the above with conventional surfactants selected from the groups containing anionic, cationic, nonionic, Amphoteric or zwitterionic. 5. A composition according to claim 4 wherein the natural polymers are selected from the group consisting of starches, celluloses, polygalactomannans, polyglucomannans and mixtures thereof. 6. A composition according to claim 4 wherein the synthetic polymers are selected from the group consisting of homopolymers of polyethylene, polypropylene, polystyrene, polyvinylpyrrolidone and mixtures thereof. 7. A composition according to claim 4 wherein the particles are selected from the group consisting of natural, synthetic, semi-synthetic or mixtures thereof. 8. A composition according to claim 7 wherein the natural particles are selected from the group consisting of bismuth oxychloride, titanated mica, fumed silica, spherical silica, polymethylmethacrylate, micronized teflon, boron nitride, acrylate polymers, aluminum silicate, aluminum starch octenylsuccinate, bentonite, calcium silicate, cellulose, chalk, corn starch, diatomaceous earth, fuller's earth, glyceryl starch, hectorite, hydrated silica, kaolin, magnesium aluminum silicate, magnesium carbonate, magnesium hydroxide, magnesium oxide, magnesium silicate, magnesium trisilicate, maltodextrin, montmorillonite, microcrystaline cellulose, rice starch, silica, talc, mica, titanium dioxide, zinc laurate, zinc myristate, zinc neodecanoate, zinc rosinate, zinc stearate, polyethylene, alumina, attapulgite, calcium carbonate, calcium silicate, dextran, kaolin, nylon, silica silylate, silk powder, sericite, soy flour, tin oxide, titanium hydroxide, trimagnesium phosphate, walnut shell powder and mixtures thereof. 9. A composition according to claim 7 wherein the synthetic particles are selected from the group consisting of nylon, silicone resins, poly(meth)acrylates, polyethylene, polyester, polypropylene, polystyrene, polyurethane, polyamide, epoxy resins, urea resins, acrylic powders and mixtures thereof. 10. A composition according to claim 1 wherein the silicone particles further comprise a non-amine functional silicone. 11. A composition according to claim 10 wherein the non-amine functional silicone is selected from the group consisting of silicone oils, silicone gums, high refractive index silicones, silicone resins and mixtures thereof. 12. A composition according to claim 10 wherein the ratio of amine functional silicone to non-amine functional silicone is from about 1:99 to about 99:1. 13. The composition of claim 1, further comprising a deposition aid. 14. The composition of claim 13, wherein the deposition aid is a cationic polymer. 15. The composition of claim 14, wherein the cationic polymer has a charge density of from about 0.5 to about 7 meq/g. 16. A composition according to claim 1 further comprising a suspending agent. 17. The composition of claim 1, wherein the amine functional silicone has less than about 0.2% nitrogen by weight of the amine functional silicone. d) adding the emulsion to the balance of the shampoo composition and mixing to achieve a homogeneous composition. MX2007006964A MX2007006964A (en) 2004-12-10 2005-12-08 Conditioning shampoo containing stabilized silicone particles. MXPA04011712A (en) * 2002-06-04 2005-02-14 Procter & Gamble Conditioning shampoo containing aminosilicone.